What Is the Active Ingredient in Nair? Nair gives you smooth skin for up to a few days, without any pain. 1 What Is the Active Ingredient in Nair? Nair depilatories are hair-removing products that provide a longer-lasting effect as compared to shaving. These depilatories come in the form of cream, lotion gel or wax. They are applied straight to skin and dissolve the hair, which then easily comes off when wiped away. Skin remains smooth for a few days, without any pain or razor bumps. Nair products contain chemicals that break down hair bonds, decreasing their strength and structure. When these bonds are broken, hair can be removed. Nair is a pain-free hair removal process that can be completed in a matter of minutes. Hair grows back the same as it was removed; its thickness is not affected by these products. As compared to shaving, Nair doesn't cut hair but dissolves it, so skin is smoother longer. Many people may be thrown off by the strong odor of Nair. This smell is the result of the chemicals used to make Nair an effective method of hair removal. It contains ingredients such as mineral oil, calcium hydroxide, alcohols, lanolin, calcium thioglycolate, sodium thioglycolate and cetostearyl alcohol. These harsh chemicals, when combined, help dissolve hair by breaking its bonds. In addition, they exfoliate skin, leaving it hydrated, smooth and soft. 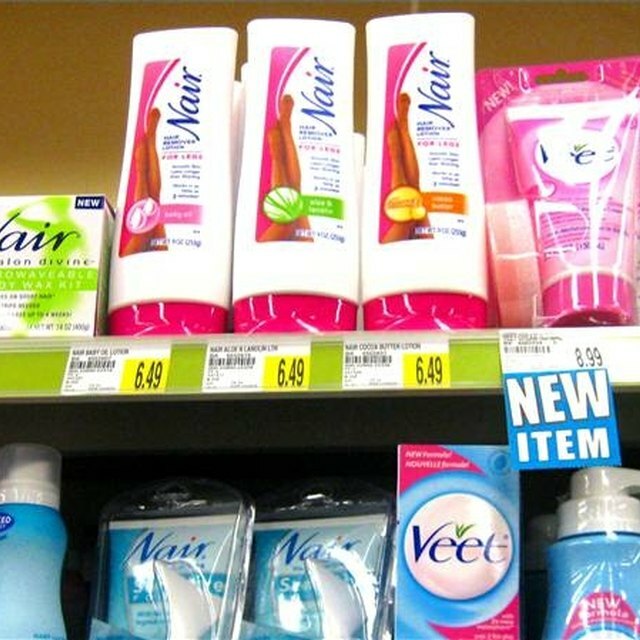 Many Nair products are scented, such as with aloe-vera extract or other fragrances. These fragrances help mask the strong smell of Nair, although they do not remove the scent completely. Nair features scents such as Cucumber Melon, Aloe and Lanolin, Cocoa Butter, and Baby Oil, in hopes of decreasing the unpleasant smell. You may smell Nair on your skin even after it is removed. To get rid of it, wash skin with soap and water thoroughly after using Nair or use a scented lotion afterward. The smell of Nair is usually the only bad side to using these depilatories. The smell doesn't last long and can be masked with soap or lotion. However, it may linger for a while in your bathroom or get on your clothes, towel or bath sponge. Choose a scented Nair product or one for sensitive skin, which may have a weaker smell than unscented formulas. Glitzy Ditzy: Nair Vs. Shaving - Which is Better for Hair Removal?